"YOKOHAMA HOT ROD CUSTOM SHOW", the largest indoor Show which is held by MOONEYES. 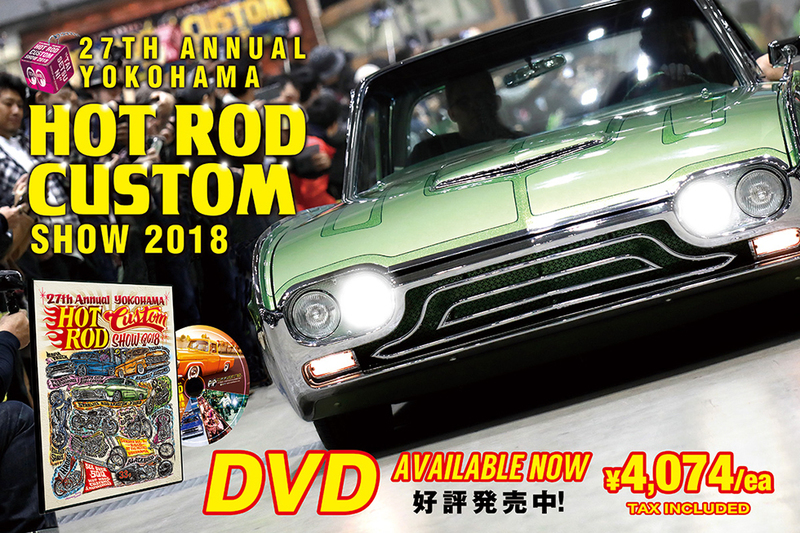 Thanks for everyone's' support, YOKOHAMA HOT ROD CUSTOM SHOW is decided to be held on Sunday 2nd of December, 2018! We have updated the details that are decided for now! HCS official Website will be updating the latest information so, don't miss it! This year’s Feature Automobile and Motorcycle is Full-Size Pickup and H-D Panhead. The automobile will largely focus on the Full-Size Pickup. Recently the heat of Chevy C-10 and other Full-Size Pickup are "Out of Control"! Feel the heat at the venue. Any year model is acceptable. The theme is the motorcycle with H-D representative Engine "Panhead" Motor. The theme title is as it is "Eternal Panhead", Panhead owner it is finally your turn!! "Frying Pan" is the base for Custom Paint Contest. From the one in your kitchen, Old and New, Any Frying Pan is acceptable. Frying Pan will turn "Strictly Hot!" to your house's ornament! "Cherish Our Kulture – 大切に – Tai setsu ni"
The campaign started from "Be Calm Not Loud / Shizukani" in 2014 following, "Save The Yokohama Hot Rod Custom Show" in 2015, "Respect our Kulture / MAMOROH" in 2016 and last year was "Grow Together / SODATEYOU". For this year, "Cherish Our Kulture / Taisetsuni! " We will be working on this capping through the year so, let's Cherish this precious Life Style together and support us! Please support us to spread this slogan!